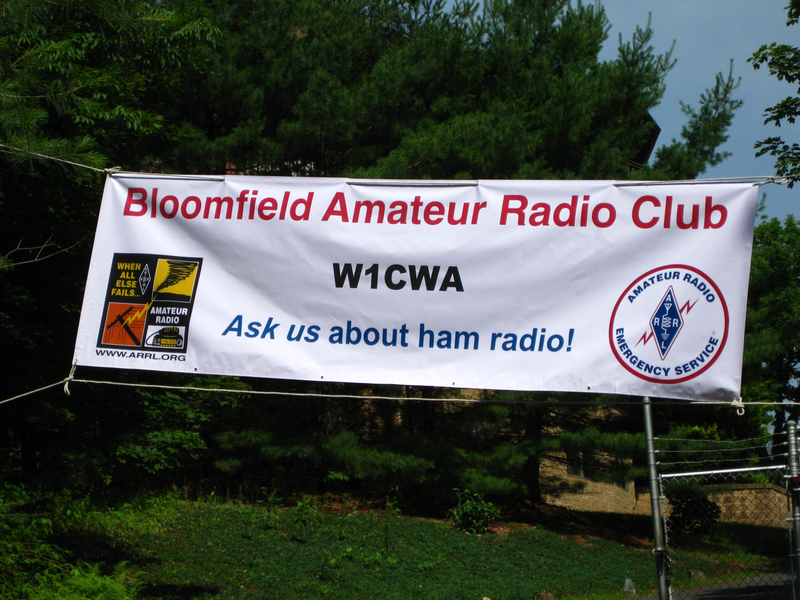 The Bloomfield Amateur Radio Club is an ARRL-affiliated amateur radio club in Bloomfield, Connecticut just north of Hartford. We work with an active VE team (administering monthly license exams), we operate a weekly net and a 2m (146.820 MHz) repeater, and encourage participation in ARES and public service events across central Connecticut. We are one of several Hartford-area clubs, each with a different atmosphere and interest, and we work closely with the other clubs on mutual projects and ARES events. Every year, we participate in ARRL Field Day and have a good time. We encourage those with an interest (or even curiosity) to join us on Field Day and see what modern amateur radio is all about. We use the Field Day as an opportunity to compete for points, try out new equipment and techniques, demonstrate amateur radio to the public, and have even administered license exams on site. The club membership is a diverse group: engineers, students, retirees, insurance professionals, entrepreneurs, all ages and backgrounds. Some of our newest members joined while they were students assigned to Hartford-area businesses as co-ops or interns. Other members now live far away but still regularly keep in touch via amateur radio. The membership includes hams who have been licensed for more than 50 years, and those who joined on passing their technician exam. The club expresses the diversity of amateur radio itself: some members are interested in only CW (morse code) operation, DX (foreign stations), satellite communications, building equipment, emergency response, or education. Some of our members operate mobile, from apartments and homes, or rarely get on the air at all – preferring instead the opportunity to tinker and experiment with communications technology. Click here to read some of our member’s stories. The Bloomfield Amateur Radio Club became an ARRL affiliated club on January 23, 1965. The callsign W1CWA was acquired after the tragic passing of club member Don Clark. Today the only surviving charter member of the club is our past trustee, Don Moore, the owner of Bloomfield’s landmark Moore’s Sawmill. Thank you to Jack Barber, W1PRT and Roger, K1PAI for contributing to this history! “You have asked about BARC’s origins. Ruth K1IIF (to be) and I had moved to Bloomfield in 1948. I had been was a co-founder and volunteer in the East Hartland fire company, so it was natural to sign with the Bloomfield Center Fire Co, a mile from our creaky old house at the end of Gabb Road. My fellow fireman George Hart W1LIH (he was sales honcho at Hatry & Young radio store in Hartford) and I knew the FD badly needed communications, so we promoted a bulky pair of G.I. surplus transceivers and set them up on the ten meter ham band. We were much into emergency radio . This was an unheard of advance in those postwar years. George and I and a few local hams then decided we should have a radio club separate from the FD, for both fun and emphasis on emergency work, so BARC was named and created. (Don’t confuse W1LIH with the well-known George Hart of the ARRL). George later retired to Florida and became W4LIH. – Jack Barber W1PRT/7. November 13, 2012. “Your info is accurate. W1CWA was the call of Donald Clark of Bloomfield, Blue Hills area. He also had a younger brother Pat, also a ham, I forget his call. Both guys were active in the Bloomfield radio club (BARC). Your Dad was an active, enthusiastic member and assistant EC. I think I was the local EC and radio officer at the time, 1960’s. – Jack Barber W1PRT/7. November 7, 2012.